Hand-made GYN Exam Table Stirrup Covers designed to help patients feel more comfortable during exams. ExamFootsiestm add specific design elements to exam rooms. 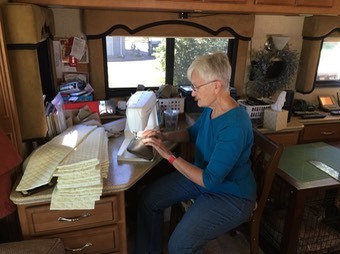 Every pair of ExamFootsiestm is individually designed and hand-made by a retired OB/GYN Nurse Practitioner who successfully used them in her practice for many years. Special orders are welcome. If you already have fabric that you would like to use, or have in mind a certain fabric that isn’t featured in my collections, please don’t hesitate to contact me. Fabric availability is limited and new fabrics are frequently added to the inventory on my collections page. Please bookmark this site so you can check back for new offerings. To order, send me an email with your desired pattern(s) and the number of ExamFootsies© needed or use the PayPal® order button on each of the collections pages. See my prices & ordering page for more information. You may pay directly by check or by using a major credit card through PayPal®. Thanks for looking. I’m eager to hear from you. …The staff and patients LOVE the others we ordered from you! I placed this order for another location of ours. ...your booties fit beautifully on the stirrups and slide in and out of the beds easily which is so important to our Doctors. Beautiful and functional! Your footsies are TOP QUALITY. We LOVE Them!